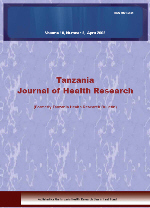 RANGE, NYAGOSYA; FRIIS, HENRIK; MFAUME, SAID; MAGNUSSEN, PASCAL; CHANGALUCHA, JOHN; KILALE, ANDREW; MUGOMELA, APOLINARY & ANDERSEN, AASE B.
Anti-tuberculosis drug resistance is a major problem in tuberculosis (TB) control, particularly multi-drug resistance TB (MDR-TB). The objective of this study was to determine the prevalence of primary and acquired anti-TB drug resistance among newly diagnosed pulmonary TB (PTB) and relapse cases. Sputa were collected from newly diagnosed and relapse PTB patients. Drug susceptibility tests (DST) were performed on sputum culture positive isolates of Mycobacterium tuberculosis using resistance ratio method on four first-line anti-TB drugs: rifampicin, isoniazid, ethambutol and streptomycin. Demographic and anthropometric information was collected and HIV status was determined. Of the 523 culture positive isolates, DST results were available for 503 (96%), 455 were new and 48 were relapse cases. Resistance to at least one of the four drugs was observed in 7.8% (39/503) of the isolates, 7.3% (33/455) were new and 12.5% (6/48) were from relapse cases. Mono resistance to isoniazid was higher in both among new 45.5% (15/33) and relapse 50.0% (3/6) cases. Resistance to rifampicin and streptomycin alone was equal 4/33 (12.1%) and only among new cases. Resistance to ethambutol alone was only one among new cases. Overall MDR-TB prevalence was 2.4% (12/503), nine were new and three were relapse cases. MDR-TB was 17.9% (7/39) for rifampicin and isoniazid. Prevalence of HIV was 43.3% and was similar among new and relapse cases and not risk factor for drug resistance. Majority of PTB patients (52%) had BMI below 18 kg/m2. Those with BMI greater than 18 kg/m2 were more likely to develop drug resistance than those with BMI below 18 kg/m2 (P=0.004). With the resurgence of TB and the high prevalence of HIV among TB patients, prevalence of drug resistance is still low both among new and relapses cases. Despite the current low drug resistance, there is a need for continuous monitoring of the resistance.